Insider: Omega Seamaster Aqua Terra >15,000 Gauss. A Truly Anti-Magnetic Watch with a Display Case Back. 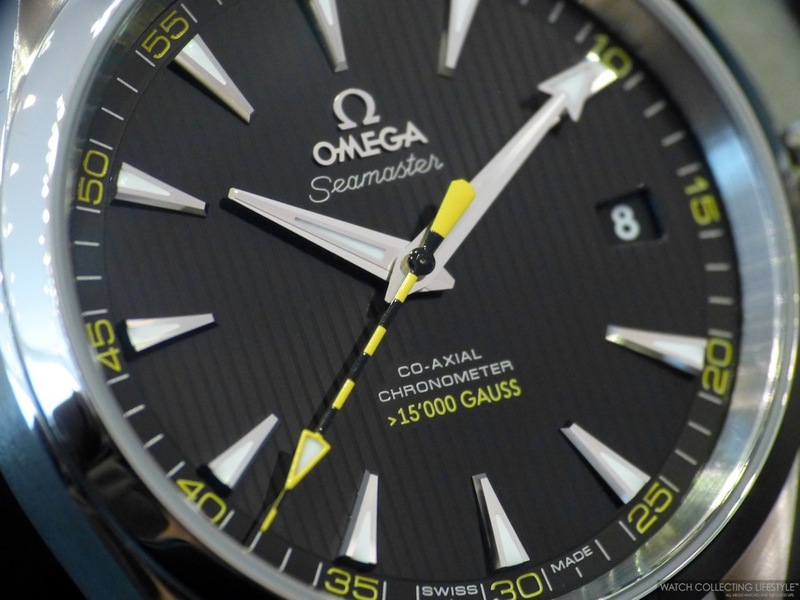 Before we go into our in-depth review of the new Omega Seamaster Aqua Terra >15,000 Gauss ref. 231.10.42.21.01.002, let's start by providing you with some historical context and explaining what is truly considered an anti-magnetic watch. An anti-magnetic watch is one that is able to run with minimal deviation when exposed to a certain level of magnetic field. The ISO —International Organization for Standardization— issued a standard for magnetic resistant watches, which many countries have adopted and which is referred as the ISO 764 Horology—Magnetic Resistant Watches. According to ISO 764, a watch must resist exposition to a direct current magnetic field of 4,800 Amperes by meter and keep its accuracy to ± 30 seconds/day as measured before the test in order to be acknowledged as a magnetic resistant watch. To give you some context of electromagnetic fields in gauss, a small neodymium-iron-boron NIB magnet creates a field of 2,000 gauss and an MRI machine anywhere between 600-70,000 gauss. The first recorded experiments in anti-magnetic watchmaking date back to 1846 when the watchmakers from Vacheron Constantin were among the first to experiment with anti-magnetic features assembling the first anti-magnetic watch only several decades later in 1915. Their watch was able to withstand magnetic fields because some of its parts were made of non-magnetic metals with a palladium balance wheel, balance spring and lever shaft. 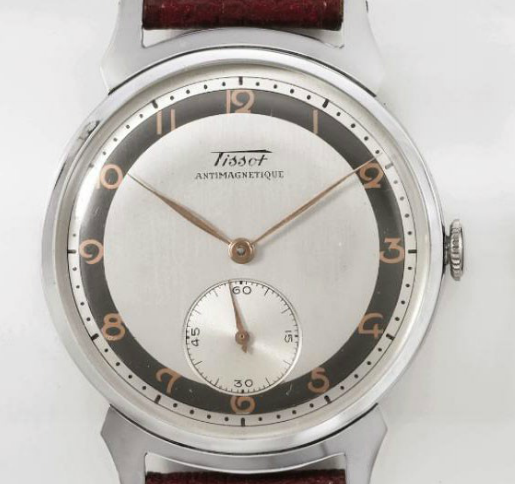 Later, in 1929, Tissot assembled the first ever non-magnetic wristwatch. Since their appearance, anti-magnetic watches have been favored by people who deal with high magnetic fields. They are widespread among electronic engineers and in other professions where strong magnetic fields are present. Today, even divers' watches according to ISO 6425 must be anti-magnetic. There are two ways of creating an anti-magnetic watch, the first is by using different non-ferrous alloys —like the Glucydur balance and Nivarox hairsprings— in the movement components and the second one is to house the movement in a casing made of soft iron like on the Rolex Milgauss or the IWC Ingenieur. 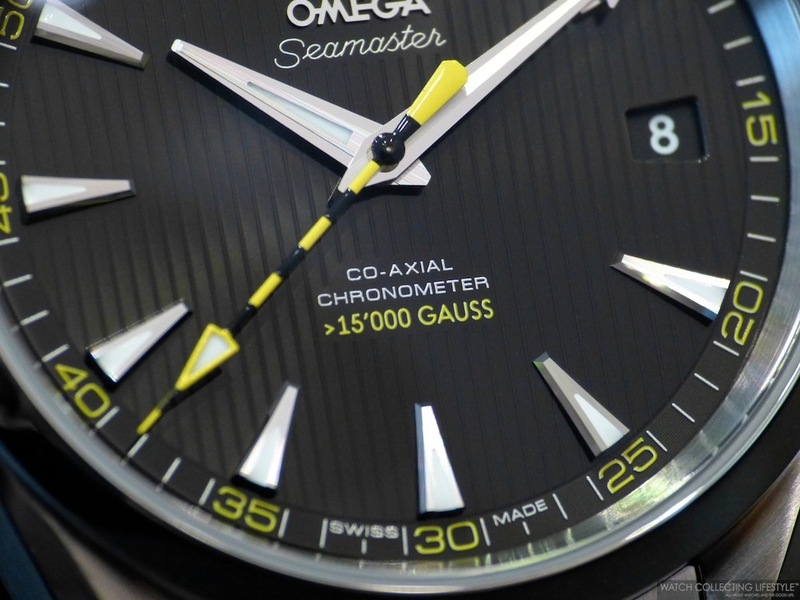 This year, Omega created the first anti-magnetic watch in their line-up by launching the Aqua Terra >15,000 Gauss ref. 231.10.42.21.01.002, a very special stainless steel watch fitted with the Omega Co-Axial caliber 8508, one of the most dramatic technological innovations resistant to magnetic fields greater than 1.5 tesla —15,000 gauss—, exceeding the levels of magnetic resistance achieved by any other watch ever made. As a reference, the new Aqua Terra 15,000 Gauss can withstand 15 times more magnetism than the Rolex Milgauss —1000 gauss. The Seamaster Aqua Terra > 15,000 Gauss is fitted with a 41.50 mm stainless steel case with brushed and polished areas and with a matching bracelet or on a brown leather strap —ref. 231.12.42.21.01.001. The watch is fitted with a very distinctive sunburst black lacquered dial with the traditional vertical lines of the dials on the Aqua Terra watches, applied markers with luminescent material, a yellow minute track, a date aperture at 3 o'clock, a yellow transferred legend that reads '> 15’000 GAUSS' and a very nice seconds hand in the traditional black and yellow colors of the magnetic field warning symbols. The bracelet is nicely done with a double folding clasp and polished center links. The bracelet is extremely light but quite comfortable on the wrist. The beating heart inside this watch is the automatic Omega in-house calibre 8508 fully made of non-ferrous components to guarantee its anti-magnetic properties. The movement provides a power reserve of 60 hours when fully wound. The technology developed by a team of ETA, Asulab, Nivarox FAR and Omega engineers led to the first prototype of the movement. Unlike other efforts to combat the effects of magnetism, this Omega movement does not rely on a protective case inside the watch case but on the use of selected non-ferromagnetic materials in the movement itself. Several patents are pending for the new movement which, even after exposure to a magnetic field greater than 15,000 gauss, still performs at a chronometric level as defined by COSC. The greatest advantage besides its anti-magnetic properties, is that the movement can be fully appreciated via the display case back, unlike the Rolex Milgauss or the IWC Ingenieur. The watch is also waterproof rated to a depth of 150 meters/500 feet. On the wrist the watch wears nothing but comfortable. The case is quite thin making it quite easy to be tucked under the cuff of a shirt. This is a watch that is definitely one than can be a great conversation piece and a reliable timepiece with a movement that is a real workhorse. We would like to provide special thanks to our friends at the Tourbillon Boutique in Chicago for letting us come in and review this timepiece now that the press loaners are quite scarce these days. Sticker Price $6,600 USD. For more info on Omega click here. 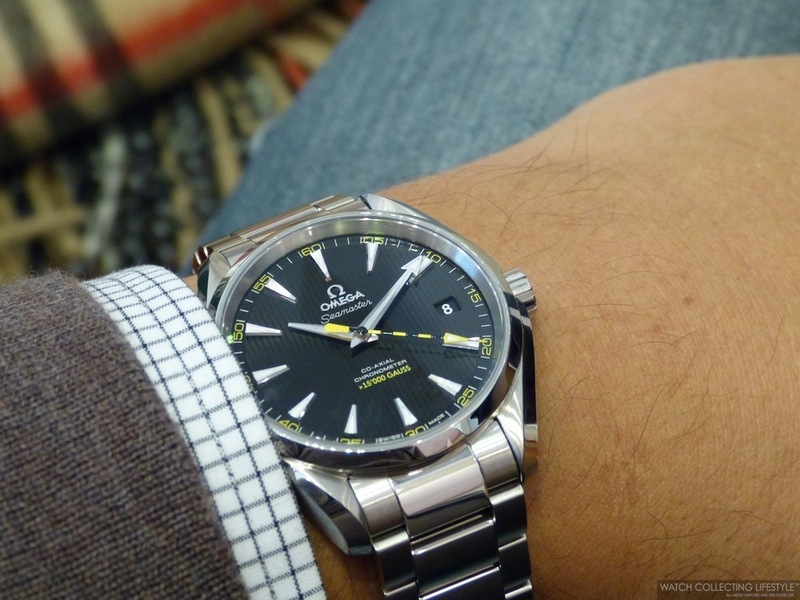 Posted on December 27, 2013 by Editor & Publisher and filed under Omega and tagged Omega Seamaster Aqua Terra 15000 Gauss Omega Aqua Terra ref. 231.10.42.21.01.002.